Congratulations to Ron Santo. | ninety feet of perfection. Well it finally happened, Ron Santo has been inducted to the Baseball Hall of Fame and I couldn’t be happier as he has ALWAYS been a Hall of Famer in my opinion. While it’s bitter-sweet due to the fact that Ron passed away a year ago (a year and 2 days to be exact) and is not around to be able to appreciate the honor, it’s still a great day for his family and the entire Chicago Cub organization. I will never understand or entirely agree with the Hall of Fame voting committee. A ball player is either a Hall of Famer or not. There shouldn’t be too much debate regarding the issue and if there is then it shouldn’t take years or even decades to decide (*cough Golden Era Committee cough*). Why some players have to wait so long is unreal, even for someone like myself who understands the voting process more so then the average person. It’s getting very messy on different levels and it’s only going to get messier in the next couple years due to certain issues I will not dive into. I am aware that I am not offering any suggestions or alternatives here, it’s just some good ole’ complaining about an issue that I know is shared by many people like myself. Back in January of this year, Eric Karabell and the Baseball Today guys released a great Podcast which tackled these questions and frustrations better than I ever could. Since then I have suggested to anyone who listen to check it out. This specific Podcast can be found HERE. 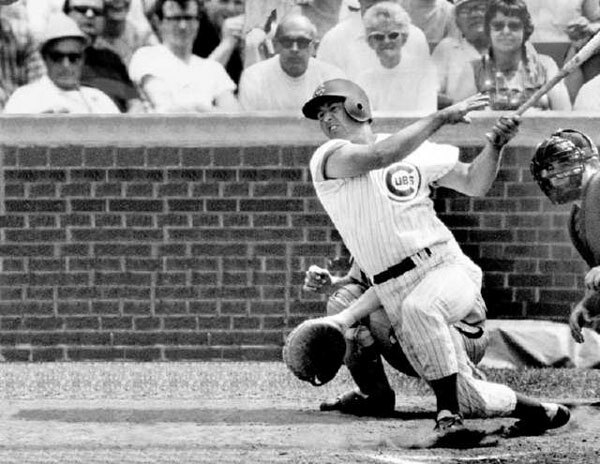 In any case, congratulations to the late Ron Santo. He was truly one of the greats and now that fact will be recognized by the Baseball masses come July 22nd, 2012 when he is inducted into Cooperstown. ~ by duaneharris19 on December 6, 2011. I couldn’t help myself. He finally makes it now? Had to vent, a bit. Thanks for checking out the 90 feet of perfection. I checked out your blog, and specifically you Santo post. I can’t agree with you more in regards to Santo and Buck. Keep up the good work, I like what youre doing on Grand Old Game! ps. I was reading some of my old childhood issues of “Baseball Digest” last night and I came across an issue in which a reader wrote in and was complaining about the absurdity that Santo had not been voted into the HOF. This issue was from 1991!